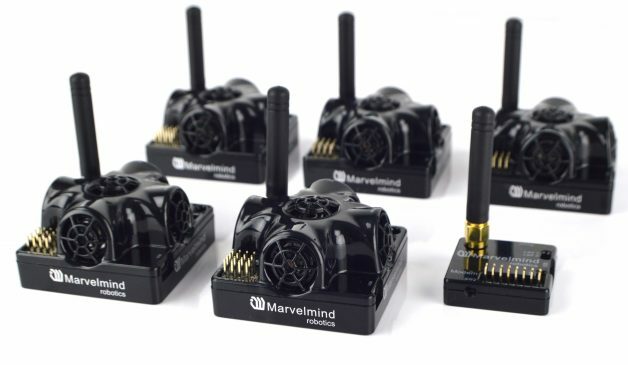 This article explains how a MarvelMind system can be as a short-range substitute for a GPS allowing position control modes like Auto and Guided. See the user manual for more details on the system. Support was added in Copter-3.6 and Rover-3.3. This wiki page is a work-in-progress. Set the stationary beacon with the lowest address as the origin in your dashboard. The height of every stationary beacon, from the ground, must be set on the dashboard. The hedge should be set to output Marvelmind Protocol at baud rate of 115200. Ensure that Copter-3.6 (or higher) or Rover-3.3 is loaded onto the flight controller and connect with a Ground Station (i.e. Mission Planner).